I love Greg Rucka’s work. Comic Bento sent me what was actually the second volume in his Stumptown series, explaining that the first volume wasn’t needed to enjoy the work. That was largely true, and then I discovered a second treat when I did a little research into the series itself. It seems Rucka made himself a small combined universe. 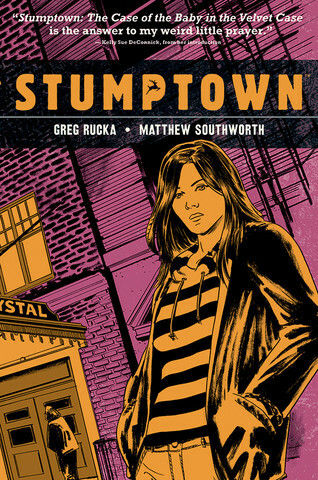 The Stumptown protagonist, Dex Parios, is a private detective living in Portland, Oregon. Apparently, in the first volume, she had some problems with a crime lord and now she won’t take a case related to him in any way. Fortunately for her, rocker Mim Bracca of the hot band Tailhook comes in with what sounds like a simple case: someone took her favorite guitar, the one her dead father got for her when she was a kid, and she’d like it back. That’s the “baby” of the title. Where was the treat? It turns out that Mim was the same Mim that was the protagonist of a novel of Rucka’s I’d read and enjoyed a bunch of years ago called A Fistful of Rain. See? Combing universe. Supposedly, it’s also the same universe as Rucka’s Atticus Kodiak novels, as they all share some minor characters. Of the five chapters, I’d say Rucka and artist Matthew Southworth pulled off some really good stuff in chapter four, as it features a pair of well-executed car chased between Dex, first following, and then fleeing, a pair of skinheads in her classic Mustang. Beyond the basic case, there’s the usual sort of breezy and fun work that comes with a good detective story, plus the usual strong female lead that Rucka specializes in. Even in cases where he works on books with male lead characters, he’ll find or add a strong female to the cast, so that really isn’t a surprise. About the only complaint I have is just that there were clearly characters in there I didn’t quite get due to not reading the first volume. But that wasn’t anything insurmountable, and I’m going to give this a solid nine out of ten drawbridge jumps. NEXT BOOK: Spinning off from Dynamite Comics’ Project Superpowers comes a story from writer Warren Ellis called Blackcross about a nasty thing outside a small town from the looks of things. I’m not sure what it’s about just yet, but I suspect it will be somewhat horrifying.